Digital Smart Homes understands no matter how sophisticated or elegant an electronics system might be, if the system does not fit into a professionally designed space, the final look, feel, and comfort level of the room may be compromised. 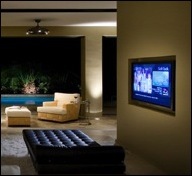 Many Interior Designers have experienced frustration working with media and home theater rooms because of poor communication with the audio video installation team or making Audio/Video an after thought. Multi-use family rooms also present a special set of contradictory needs, but mostly how to integrate displays, speakers, electronics, and wiring into a space where the overall design is critical to the home's success. A Digital Smart Homes Technology and Design Consultant liaisons with the client, designer, contractor and our own installation and sales crew. We select the appropriate products and materials to design individual integrated systems. Our Technology and Design consultants thrive on that challenge and truly enjoy's working with designers. Our team of professionals will provide you with sensitive electronics design help, clear explanations of what "real estate" is needed to claim for the homeowners systems, prompt communication, true attention to detail, and rapid response to the inevitable challenges. In doing such, we have experienced a wealth of loyalty from Interior Designer and Architects, which has gone a long way towards our success.